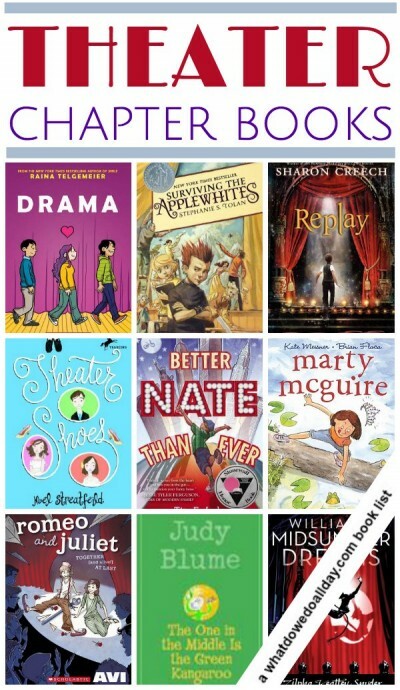 I loved reading the theater-themed books for this list! As I said a few weeks ago, when I shared 12 of my favorite picture books about the theater, our family has made theater an essential part of our lives. I’ve often joked that all my theater training serves me well, now that I spend so much time reading aloud to the kids! But you don’t have to be a theater geek to love these books. There’s something about the subject of theater that lends itself to comedy. I suppose it’s because there are so many things that can go wrong when a group of people gather together to create a production. Authors have so much comedic material imagining all the stage mishaps and anxious emotions of actors! Many of these books will definitely make your kids giggle, whether the kids have any aspiration for the stage, or not. (Note: all book covers and title links are affiliate links.) I’ve divided the books into “middle grade” and “early chapter” books below. So-called “early chapter books” are for kids ages 5-10, depending on reading level. They are for kids who are just starting out on chapter books. Many lengthy book series, like Magic Tree House have at least one book that centers on the stage, but I’ve chosen to highlight only my favorites. Marty McGuire is one of my favorite early chapter book series. Marty is the quintessential tomboy. She loves getting muddy, catching frogs and rejects pink, sparky tiaras. She is therefore horrified when her teacher gives her the female lead in the class play, The Frog Prince. Playing a princess! Ugh! Marty and her friend, who plays the role of the prince, decide that the play could be improved with the help of a real amphibian. Utterly delightful. Also available as an ebook. The One in the Middle Is the Green Kangaroo is a very short book about middle child, Freddy, who decides that starring in the school play is a sure-fire way to set himself apart from his older, and younger siblings. Judy Blume books are always worth reading and I hope you’ll pick up this charming and funny story. It’s good for both independent reading and as a quick chapter read aloud. Also on my list of early chapter books about families. Star Time is part of Patricia Reilly Giff’s popular Zigzag Kids series. This is a great choice for kids starting out on chapter books and is one of those “wholesome group of kids” books. You probably know the type. Giff is a talented writer and keeps things interesting throughout this tale of friends at an after school center who decide to put on a play, but must deal with more than one kid wanting to be the star of the show. Also available as an ebook. Middle grade books are generally aimed at kids ages 8 to 12. They can deal with slightly heavier, or more “mature” subject matter, and in general are much longer than early chapter books. Most of these titles are quite funny. Surviving the Applewhites. Jake has gotten kicked out of his last school and now has come to live with the eccentric, artistic, homeschooling Applewhite family. The father has taken on directing a local production of “The Sound of Music” and no one is more surprised than Jake when he finds he loves performing. I loved the quirky characters and the boundless energy of this book. When the family has to pull together to get the show up after they are blackballed by a local stage mom, the results are hilariously successful. I really enjoy how the story reinforces the necessity of cooperation when putting on a play. I also recommend this as a terrific read aloud. A 2003 Newbery Honor book. Also available as an ebook. Better Nate Than Ever and Five, Six, Seven, Nate! . 13 year old Nate’s snappy narrative about his adventure in New York City auditioning for E.T. The Musical (yes, that’s right) is marvelous and incredibly funny. The scene in which Nate reads the “sides” during his audition had me laughing so hard I could barely see the words through my tears. I am currently reading the sequel, in which Nate experiences the ups and downs of rehearsing for a Broadway show and it is just as wonderful as the first. Also on my summer reading list for 8-12 year olds. A New York Times Notable Book of 2013. Also available as an ebook. A Star Is Born is book three in award winning author Walter Dean Myers’ The Cruisers series. The Cruisers are a group of middle schoolers who write a newspaper at their school for gifted kids in Harlem. LaShonda gets a chance to receive a scholarship for her work on costumes but it conflicts with her need to take care of her autistic brother. The heart of the book is the way the group of friends come together to help LaShonda. Myers tackles some important subjects about disadvantaged kids, poverty, and tolerance, but the story is not at all depressing. Interspersed between the chapters are pieces that the kids write for their newspaper, which comment in some way on the main action of the story. The text of the kids’ script, based on what happens to Shakespeare’s characters during “Act 6” is at the end of the book. Also available as an ebook. The Ellie McDoodle Diaries: The Show Must Go On . The Ellie books are written in the same format as Diary of a Wimpy Kid, but I like them better than that series. I like this book because Ellie is the stage manager and if you have never worked in the theater, the stage manager is the most under-appreciated job! If you do work in the theater, you know how crucial a good SM is. Ellie has to navigate the pressure of being blamed for everything that goes wrong as well as having to figure out how to fix everything. This is a fun installment in a series which is perfect for so-called “reluctant readers.” Also available as an ebook. Romeo and Juliet Together (And Alive!) at Last. Don’t tell me you never wished Romeo and Juliet would have a happy ending. Well, here’s your chance. 8th grader, Ed, narrates this quirky story about how he and is friends arrange a school production of the famous tragedy in order to bring two shy friends together. Avi is a stellar storyteller, bringing much humor to this tale. Whatever can go wrong on stage does, and hilariously so. It’s not just a story about putting on a play, however, it’s also a charming story about friendship. It’s a short novel, making it a good choice for older kids (the protagonists are 8th graders) who may balk at long books. My 9 year old read it and enjoyed it, too. Drama is a middle grade graphic novel. Graphic novels are not generally my thing (my son loves them), but for the sake of the theater I set aside my prejudice. It’s also had several great reviews. I have to say, I enjoyed it! Callie wants to be in her school’s latest production but she doesn’t think she can sing so instead she helps out as the set designer and is determined to create a Broadway-worthy show. The “drama” of the books title could easily refer to the friendship and romantic entanglements of the middle school crew (when is middle school not melodramatic?) as well what happens on the stage, and it also means I recommend this book for kids ages 11 and up. Also available as an ebook. Theater Shoes . What can I say about the awesomeness of Noel Streatfeild? You are likely familiar with his most famous title, Ballet Shoes. Well, the now grown-up stars of that book give drama school scholarships to three promising orphans with a stellar theater pedigree. The Fossil sisters from Ballet Shoes remain in the background as these new children attend Children’s Academy of Dancing and Stage Training in London during World War II. William’s Midsummer Dreams, set in the 1930s, is the sequel to William S. and the Great Escape, which I have not read. You may recognize Snyder as the author of the 1960s book, The Egypt Game. I’m guessing I may have understood a bit more about the characters, especially William’s relationship with his father and half-brothers, if I had read the first book, but it can be read as a stand alone title. 13 year old William is living with his Aunt Flora. He auditions for, and gets the role of Puck in Shakespeare’s Midsummer, but in doing so he makes an enemy of the son of dean of the performing arts school. William must deal with a lot of complicated family relationship issues, but the descriptions of his experience coping with stage fright and learning his part ring true. Also available as an ebook. All the World’s a Stage: A Novel in Five Acts is a historical novel where the great Shakespeare himself plays a role. Twelve-year-old Kit gets caught pickpocketing in the audience during a performance and instead of sending him off to prison, the Lord Chamberlain’s Men decide he will work for them instead. During the course of his employment, Kit becomes enamored with theater life and when the company is threatened with eviction, Kit helps them steal the theater (you will have to read it to see what I mean!) to build The Globe. Lots of fun, especially for Shakespeare fans. This would be great to read in conjunction with learning about The Bard. Replay . Leo the dreamer is the middle child in a large Italian family. One day he finds his father’s diary in the attic. In the diary (in which his father is 13 years old) he learns that his father also dreamed of being a performer. When Leo gets a part in a school production, the two threads of family life and stage life intertwine throughout the book. The text is crafted around short vignettes, which, admittedly took me a bit of time to get used to (although my 9 year old didn’t seem to have that problem). Some of the action is also written out in playscript form and the script of the school play is included at the end of the novel, adding another layer of insight to Leo’s character growth. I loved the rehearsal scenes and the description of the acting exercises. The combination of Leo’s excitement and nerves during the performance was spot on. An exceedingly well-written book. Also available as an ebook. For more suggestions, check out my 12 favorite picture books about the theater about theater, or peruse the master index of all my book lists. The Ellie McDoodle series is one of my girls’ all-time favorites! We all agree that we like it better than the “more popular” series. We have all of them and they’ve been read many times over. Fantastic list! I love the theater, and it has become a big part of my family’s lives as well. Off to check out your picture book list!